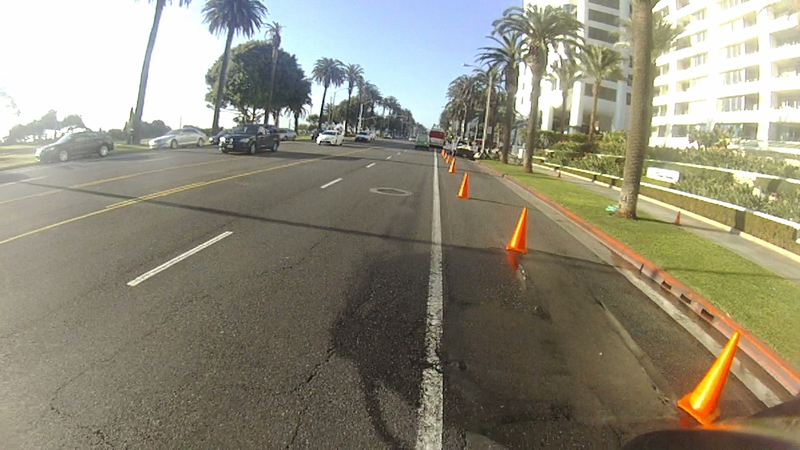 A week or so back, I was riding eastbound on San Vicente Blvd in Santa Monica, a block or two above Ocean Ave.
It’s my usual route home after biking to the beach; drivers seem familiar with the bike lanes there, and, for the most part, seem to respect and stay out of them. Except for delivery drivers, that is. 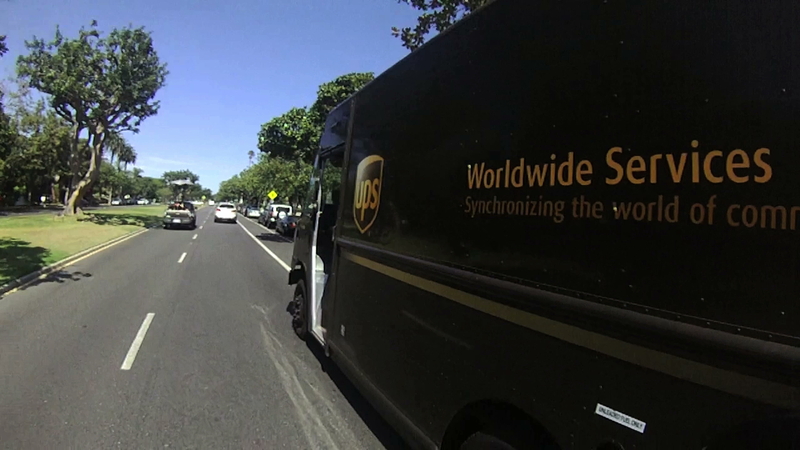 The lane ahead was blocked by a UPS truck. So I checked the traffic behind me, signaled my lane change, and rode around it before returning to the bike lane — just as a driver was pulling out from his parking spot in front of the truck, his view of me completely blocked by the large truck just behind him. Fortunately, he saw me in time and jammed on his brakes. There was nothing I could have done to avoid a collision; hitting my own brakes would have left me directly in his path, while swerving to the left would have put me in front of traffic coming up rapidly from behind. Unfortunately, it’s not an unusual problem. 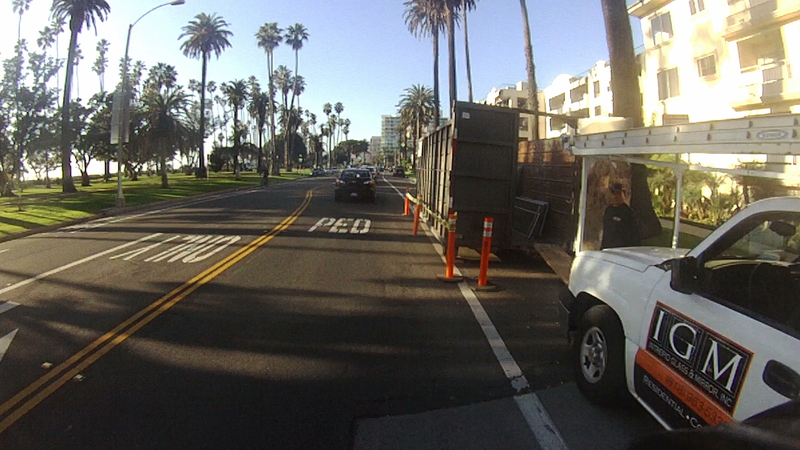 Spend time riding the bike lanes that bisect Santa Monica, and you’ll find your way blocked on a nearly daily basis. Sometimes several times the same day. Or the same block. While Santa Monica is rapidly installing bike lanes — including the city’s first green bike lanes — they seem to do little to ensure that the lanes are kept clear and ridable. The city’s bike lanes are frequently blocked by construction work, forcing riders to compete with impatient drivers for reduced space in the traffic lanes. Meanwhile, a lack of coordination magnifies the risk, as happened recently when construction work obliterated the northbound bike lane on Ocean Ave between Pico and Colorado, while the most practical alternate route, the recently installed bike lanes on Main Street, were blocked by construction at City Hall. Sometimes it’s necessary to block a bike lane; after all, you don’t want to ride through a construction zone where your helmet — or lack of one — is all that stands between you and swinging cranes or falling construction materials. Some other cities seem to manage the situation better, though, requiring work crews to maintain an alternate pathway for bikes around the worksite without flinging them dangerously into traffic. 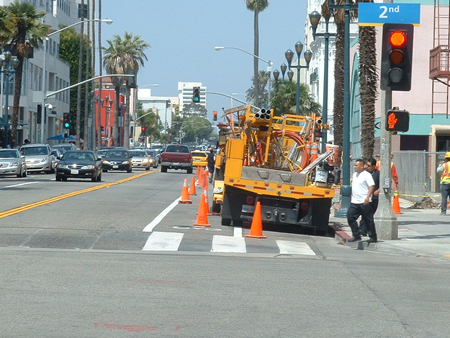 Utility crews also need to block bike lanes to do their work from time to time; in fact, CVC 21211 specifically exempts utility vehicles from the law prohibiting blocking of bikeways. Yes, bike lanes are bikeways. While CVC 21211(a) specifically refers to Class 1 bicycle paths or trails, section (b), which specifically bans parking in a bikeway, does not. 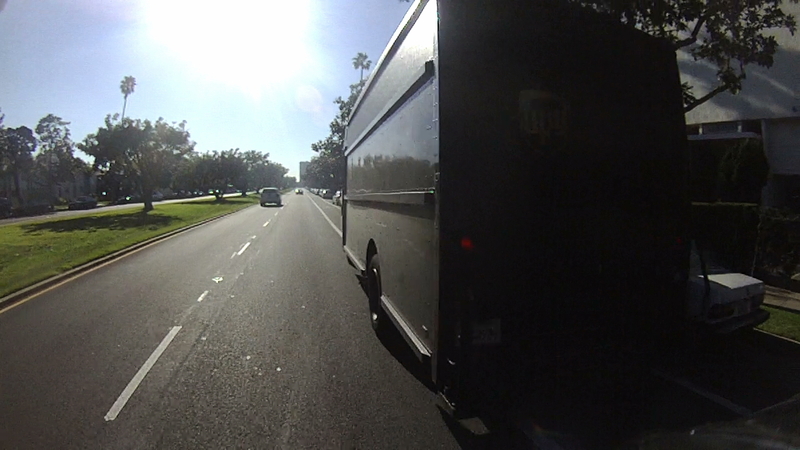 On the other hand, there is no reason why delivery trucks should need to block the lane. Or be allowed to. Yet it’s one of the most common complaints of bicyclists who ride in or through the beachfront city. Myself included. 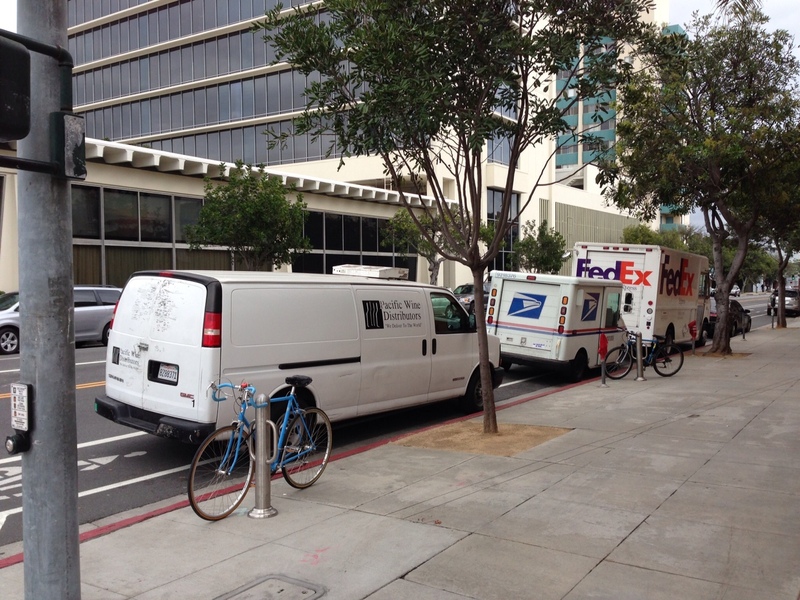 Fedex, UPS, bottled water companies, wine distributors and other trucks and vans of all sizes, purposes and descriptions seem to consider bike lanes their own personal parking plazas, even when there is adequate curbside parking available. I understand why. It’s a lot easier to stop in the bike lane for a few minutes than it is to search for a large enough space in Santa Monica’s vastly over-populated parking environment, or struggle to back out of a driveway into traffic after parking there. And delivery drivers are far more likely to be ticketed by SaMo police and meter readers for parking in a red zone or briefly blocking a driveway than for stopping in the middle of a bike lane, even though the latter is far more likely to result in actual harm. As my incident illustrates, it’s just a matter of time before someone is killed or seriously injured riding around a blocked Santa Monica bike lane, if it hasn’t happened already. Local drivers are used to the more established bike lanes and expect riders to remain in them; they may be unprepared to see a bike in front of them when there’s a bike lane next to them. Meanwhile, drivers frequently speed on open stretches of surface streets — in Santa Monica and pretty much everywhere else on the planet — and too often find themselves distracted by their proximity to the beach and the search for parking, paying little or no attention to anyone else on the road with them. To say it’s a recipe for disaster is putting it mildly. Unfortunately, it also a problem of jurisdiction in a county made up of roughly 80 separate cities, each of which may interpret state law in their own way, and often do. For instance, the City of Los Angeles regards bike lanes as legal lanes of traffic just like the traffic lanes to their left, albeit reserved for the use of bicycles, just like HOV lanes are reserved for vehicles with multiple occupants. In addition, the LAPD has concluded that CVC 21211 applies to Class II bike lanes as well as Class 1 bike paths, and enforces the law accordingly, ticketing or towing vehicles that block them. Of course your experience may vary depending on the officer and the situation. But when I reached out to a representative of the Santa Monica Police Department to ask what their policy was regarding trucks blocking bike lanes, I was told they didn’t have one — officially or unofficially. In addition, their interpretation was that CVC 21211 didn’t apply to bike lanes, but only to off-road trails. However, in a follow-up email, I was told that the Santa Monica’s City Attorney’s office would examine the law to determine if CVC 21211 does apply to bike lanes. But regardless, he added, CVC 22502(a), which requires that vehicles park parallel to and no further than 18” from the curb would apply, so vehicles could be ticketed for double parking. His suggestion was to pass carefully on the left after checking for oncoming traffic when you find a vehicle blocking the bike lane, just as I did at the beginning of this story. And if trucks double parked in the bike lane raises your blood pressure as much as it does mine, you can call the non-emergency SMPD dispatch number at 310/458-8491 to request that an officer come out to investigate. There’s a good chance the truck will have moved by the time they get there. But they may be able to catch them doing the same thing a block or two away. I’ve also tried to address the problem directly with UPS, but despite numerous promises from as high as the VP level, nothing has changed. 22502(a) doesn’t mention double parking – that’s prohibited by 22500(h). And commercial vehicles making deliveries are exempt from 22502(a) if it’s “reasonably necessary” for them to park further from the curb (22502(b), it’s right there in your link). Whether the presence of a bike lane creates a reasonable necessity is a matter of interpretation. This has been a regular issue for me on 14th at Colorado on my commute to work. Every few days there are trucks parked in the red and blocking the new buffered bike lane, delivering things to the businesses on the corner that often appear to have plenty of room in their driveways. Hope this gets some attention from the city, seems like they’d be annoyed that they’re spending so much on bike infrastructure only to have people regularly rendering it unusable. Sometime, when you have time, go for a ride, and when you get to these blockages, call SMPD on 911 and tell them there is a vehicle blocking the road and you cannot get past. Squeaky wheel gets the grease? I wouldn’t recommend calling 911, because that’s for genuine emergencies. But do call the emergency number at 310/458-8491; the more we let them know it’s a problem, the more likely they are to do something about it. Their rationale wasn’t that the vehicles were double parked, but that they were more than 18″ from the curb. But you’re right that the delivery companies could argue the reasonably necessary clause, given the problem finding parking in the area. Hopefully the Santa Monica City Attorney will come to the same conclusion they did in L.A. the bike lanes are legal lanes of traffic, and so illegal to block without a permit. 890.4 fulfills 21211.b’s “otherwise in compliance with the law” clause, as long as “no parking” signs are not posted. Therefore, parking in a bike lane is generally legal. Until the state law is changed, we need more “no parking” signs along bike lanes. SaMo? Please let that phrase die with this article. I have heard that delivery trucks build in the cost of parking tickets into their business model – the likelihood of getting a ticket is so low compared to the time savings. That is why you see so many double parked delivery trucks in SF and NYC where parking is nearly impossible. To get them from stopping double parking in bike lanes the penalty would need to be set high enough to change the corporate behavior. Yes, of course, don’t tie up 911. As it is, when you call 911, you get routed to the CHP first and they then have to figure out what PD you want. So, it is s good idea to have the local 10 digit phone numbers of the cities you spend time in programmed into your phone. BTW, this is yet again a demonstration of why the bike lane needs to be between the parking and the sidewalk! Those Dutch and Danes seem to have figured this out a long time ago. Hmm…looking at Google satellite view of 6th /Wilshire (Cynthia’s photo) shows that both blocks parallel to 6th have alleys for delivery…why not use them then? The commercial block off Ocean also has an alley. In fact it seems to me that most N/S streets in Santa MOnic are paralleled by alleys. There is no reason to block bike lanes.